The decrease of efficiency in the making of a product by producing more of it. That is, diseconomies of scale occur when a company increases its output for a product such that it increases the cost per unit of the product. For example, assume that labor costs at a factory are constant as long as the factory produces between 100,000 and 500,000 units per month. If the factory produces more than 500,000 units per month, it may have to hire more workers, which would increase the cost per unit. It is easier for smaller companies to fall into diseconomies of scale because they have less control over their costs; indeed this can cause many smaller companies to be at a significant competitive disadvantage. See also: Economies of Scale. Fig. 48 Diseconomies of scale. In the range of output beyond point X, the firm is experiencing diseconomies of scale with costs increasing as output increases. 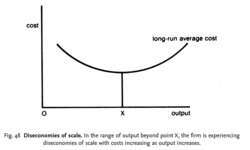 the possible increase in long-run unit or AVERAGE COST that may occur as the scale of the firms’ output is increased beyond some critical point. Initially, as output is increased, long-run average costs may at first decline, reflecting the presence of ECONOMIES OF SCALE, but after a certain point long-run average costs may start to rise. See Fig. 48 . The most frequently cited sources of such diseconomies are the managerial and administration problems of controlling and coordinating large-scale operations and labour relations problems in large plants. See MINIMUM EFFICIENT SCALE, EXTERNAL DISECONOMIES OF SCALE. Insurers that have stopped writing new annuities are likely to focus on selling off blocks of closed annuities business to allow them to deploy capital in other business lines and avoid diseconomies of scale as policies run off. We'll distinguish between the internal and external sources of economies of scale and diseconomies of scale. Over time, higher factor prices as well as diseconomies of scale will cause capital and skill to gravitate away from wealthier regions towards poorer ones. Don't even get me started on the diseconomies of scale that occur because client marketing managers are dealing with multiple agencies to do different bits of the very same thing. Passed a certain size diseconomies of scale mainly relating to loss of flexibility and responsiveness rapidly start to take their toll. It is found that industries should reduce their size as there is evidence of diseconomies of scale in our results. These large diseconomies of scale for R&D investment add new evidence to the problems that large pharmaceutical companies have to face. In many instances, low levels of production are characterized by diseconomies of scale with rising average costs, followed by scale economies after a given threshold (Dollery et al, 2012). Even if only this kind of restriction will be implemented, it will go a long way in enhancing environmental conditions and mitigating the diseconomies of scale that we are currently suffering in the metropolis. 2] reveal the presence of economies and diseconomies of scale respectively. Is Indian economy still developing? But more labour, with no improvement in either management structures, governance or operational efficiency will finally lead to what economists call diseconomies of scale or the forces that cause larger inefficient organisations to produce goods and services at increased per-unit costs.